This section of the website is devoted to individual patient stories, written by patients, to share with others who suffer from AF. Many patients have offered to discuss their story with interested people who visit this website. Let us know if you would like to contact one of our patients. Kathryn Roudebush says the only positive thing to come out of her father dealing with a decade of uncontrolled atrial fibrillation (AFib) was that she was familiar with the Wolf Mini-Maze procedure when she developed the same heart condition earlier this year. Atrial fibrillation, commonly known as AFib, is an irregular heartbeat that can cause shortness of breath, fatigue and confusion. “Knowing about Dr. Wolf’s mini-maze procedure was like seeing a light at the end of the tunnel,” she says. “I was fed up after being in and out of the hospital four times in the span of a few weeks as a result of my AFib. I can’t imagine how my father felt after dealing with it for so many years.” She remembers watching her father, Joe Roudebush, sink into a deep depression because of his uncontrollable AFib. The National Heart, Lung and Blood Institute (NHLBI) says the most serious complications from AFib include stroke and heart failure. That’s why common forms of treatment include medication and procedures to prevent blood clots and control heart rhythm. The elder Roudebush recalls feeling hopeless after those treatments failed to control his rhythm. “I was on the brink of suicide because I didn’t know what to do. Other physicians I spoke with had run out of options for me. When I saw a notice about a seminar on the Wolf Mini-Maze, I had a glimmer of hope for the first time in years,” he says. Dr. Wolf’s minimally invasive procedure isolates any abnormally firing nerves and removes the left atrial appendage (LAA) of the heart, an ear-like flap that’s on the outside of the left upper chamber of the heart and is the source of more than 90 percent of potential blood clots to the brain. “Joe’s story is one I hear often. Patients tell me they’ve felt helpless during the course of their treatment for AFib. They don’t like the way blood thinners make them feel and other procedures simply haven’t worked. After a mini-maze procedure, not only is the heart back in rhythm, but patients are able to get off blood thinner medication immediately,” says Randall Wolf, M.D., a cardiothoracic surgeon affiliated with Memorial Hermann Memorial City Medical Center and UTHealth. Joe Roudebush underwent the procedure, and now lives free from AFib. “I remember my Dad waking up after the procedure, looking at us and saying, ‘today is the tomorrow we were hoping for yesterday.’ It’s true. Since Dr. Wolf performed his mini-maze procedure, Dad’s life has made a total turnaround,” Kathryn Roudebush remembers. So when she developed AFib this spring, she didn’t waste time traveling from Chicago to Houston to have the procedure at Memorial Hermann Memorial City. 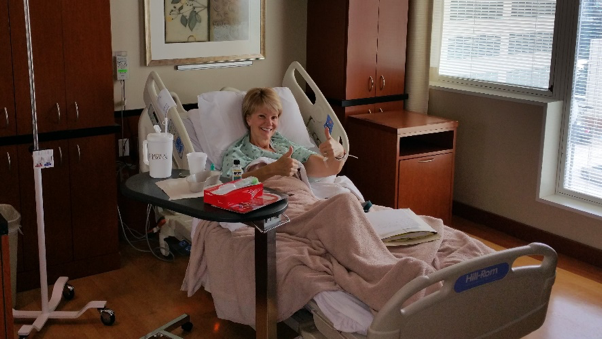 Kathryn Roudebush says she started feeling better immediately after the procedure and is now on her way to a full recovery. “My tennis team is already calling to see when I’ll be back on the courts. I’m not up for singles just yet, but I am excited to be able to play again soon,” she says. I am in sinus rhythm! I don't have to return to the cardiologist for a year!! I feel great! December 2015 my wife and I traveled to Houston, Texas from Cynthiana, Kentucky, so that I could have the Wolf Mini Maze. A year out from surgery I am Afib-free!! I have been given the go ahead to stop my last heart medication! I am in sinus rhythm! I don't have to return to the cardiologist for a year!! I feel great! I now have the energy to live life and chase after those small mouth bass! A big thanks goes out to my wife for pursuing the Wolf Mini Maze. And the biggest thanks to Dr. Wolf and his amazing staff. Without them this would not have happened. Dr. Wolf was encouraging when we ran into insurance problems. His staff worked tirelessly on it from their end while my wife worked on it from our end. Another integral part of Dr. Wolf's team is his wife. Once surgery was over, she befriended my wife and was a great help to her. Dr. Wolf and his Team gave me my active life back. No more blood thinners or Heart Meds. WOW … What a change, two months later I am completely healed and doing all the things I had stopped doing because of the AFiB. Dr. Wolf and his Team (all of them are Great) they gave me my active life back. I could go on and on about how wonderful the stay at UT Health Memorial Hermann was but the bottom line is Dr. Wolfs Mini Maze fixed me and he can fix you too. A year ago I tried and couldn't ski due to AFiB. Friday I had a great day skiing and had sinus rhythm the whole time. Thanks again for your August 2nd procedure. Every so often something happens in a person’s life that changes everything! The coincidences are unexplainable; the outcome undeniable; and the transformation far-reaching, like the ripples on a pond. I would like to share a most remarkable journey in order to encourage those who are currently battling A-Fib and all of the things that go with it! The year was 2016 and I still considered myself a new bride in my 5-year marriage to Denny. I had sold my home in Atlanta and moved to Hawaii to start our new life together. The one thing that dogged me continuously was extreme fatigue. My local cardiologist assured us both that I had a strong, healthy heart and that my atrial fib could be easily handled with medication. At that point he handed my case over to his “assistant” and I was relegated to calling her with my ongoing concerns. The desire to stay in shape was replaced with the desire to make it home from the grocery store and prepare dinner for my husband before collapsing into bed! Our Friday golf outings became more of a dread than a joy for me because I knew my feet would be dragging by the fifth hole. Our beautiful ocean-side condo was no longer relevant for sunset walks on the beach or afternoon dips in our private lagoon. All I wanted to do was go to bed and sleep away the overwhelming fatigue that gripped me like an octopus!!! One of my happy duties was to walk our two beautiful black doodles several times each day in a neighboring field. This, too, required a good amount of energy, and I made every effort to “save myself” for this labor of love. On one such occasion in July of 2016, I was walking the dogs when a very sweet young woman approached to ask if she could pet them . . . that she was missing her own dog back home in Houston. I quickly agreed, and our conversation was easy and relaxed as Leah shared her reasons for being in Hawaii and her background as a cardiac nurse in Houston, TX. Feeling I had the audience of one who could truly understand my problem, I shared my frustration with atrial fib, and the devastating effect it was having on my lifestyle. She listened intently, then proceeded to tell me about a cardiac surgeon in Houston who was doing wonderful, innovative things regarding the fight against a-fib. This was music to my ears! Once she shared the contact information for Dr. Randall Wolf, I went to work researching him online, reading testimonials of the people he had helped, and making contact with his office administrator, Cindy. After several conversations, she had Dr. Wolf contact me directly to discuss surgical possibilities. He said 10 words at the end of our conference that changed my life forever . . . “If you can get to Houston, we CAN help you!” I talked it over with my husband and started making plans for the trip! Amazingly, everything came together beautifully, like pieces of a grand and glorious puzzle . . . the opening for surgery in Dr. Wolf’s schedule, the insurance authorization to go forward, the flight schedule, and the room availability in the hotel adjoining the Memorial Hermann Hospital where my surgery was scheduled. All this was accomplished with only a two-week notice! I’ll always believe there was an angel somewhere helping to orchestrate the perfect travel scenario!!! We arrived at Memorial Hermann at the appointed time and checked into a beautiful hospital suite that had been reserved for us by Dr. Wolf. I was given a battery of tests to determine the exact function of my heart, and Dr. Wolf decided that I not only needed a maize procedure for the atrial fib, but a total replacement of the mitral valve, and repair of the tricuspid valve. These extensive procedures necessitated open-heart surgery, and we all braced ourselves for the next morning when I was scheduled for the surgery. Denny prayed over me before I left the room, and as the anesthesia was administered, I drifted into a long, deep sleep that would carry me through the 5 and ½ hour surgery. Upon completion, Denny and two friends were notified in the waiting room that all had gone well, and that I had been taken to the recovery room. Ten days afterward, I met with Dr. Wolf for my post-op follow-up and was given clearance to fly back home to Honolulu the next day. I was still weak from the ordeal, but so full of faith and hope for the future! This amazing doctor had taken on the challenge to help someone with multiple heart issues, perform more surgery than he had ever done on one person at one time, and given me a new, energetic life I could never have had without him! I will be in cardiac rehab here in Honolulu for several months, but already my energy levels are higher than they were before surgery. Dr. Wolf, Dianne Luce, Cindy Rosenbaum, and Denny Luce 10 days after surgery. Thank you Dr. Wolf for sharing the time and talent God gave you to make such an amazing difference in my life; and thank you dear Lord for so beautifully orchestrating the circumstances and hearing every prayer surrounding this life changing event!!! Since I’ve had my procedure in April 2016, many things have changed. My Afib began causing me problems around November 2015. I had a cardiovert in 2009 and had sporadic problems after that. By November, I was having a great dealof difficulty in doing many things such as working out, going shopping and other every day activities without getting dizzy or unable to catch my breath. While not exactly a shut in, I just was not able or feel like doing many things. Since I’ve had my procedure in April 2016, many things have changed. I now go to the gym more often, do my own shopping and go to the movies more. I feel better than I have for a very long time. My family says the have even noticed an improvement in my emotional state. I just wanted to update you and let you know that the chronic and progressive afib issue you treated me for is now totally non existent and thanks to you, I'm doing fantastic. I Hope you received my letter that I sent to you last year, thanking you and your staff for the excellent results that I've experienced from your surgery and also the very fine treatment my wife and I received from everyone at the hospital while in Houston. We're very thankful for everything you did and the significant improvement to my (our) life that your procedure and skilled hands made possible. Dr. Wolf is my hero. I found your website and the information about the Wolf Mini-Maze on line that weekend. I sent you an e-mail describing my situation and you asked for my phone number. You called me Monday morning and we discussed the possibility of my coming down to Texas for the operation. I sent you my records and we set a surgery date. I met you as planned the day before the procedure and knew then I had made the correct decision in taking this course of action. You are obviously extremely competent, very conscientious, and took a true interest in helping me. I was very impressed that you have successfully done over 1000 Mini-Maze procedures. I watched a Mini-Maze operation on line and your attention to detail was incredible. I liked the fact we could leave my “engine running” and have a less invasive operation.I was discharged after a day and a half. I stayed in Texas a few more days before you examined me and sent me home. I am in perfect rhythm and “we’ll see you in six months”. I am off blood thinners and ready to quit the anti-arrhythmic pills.I go to the gym 4-5 times a week and am able to work out normally without being fatigued. I feel great and hope other people with this condition can take advantage of the fantastic medical capabilities you possess. Ollie Ganoung ... Redding CA. One year ago today Dr. Wolf did my surgery and changed my life. He and I grew up 20 miles apart - who knew he'd do so much for me. Please tell him I am thinking of and praying for him, his family, and his new venture there with especially grateful thoughts today. "Completely eliminating my Atrial Fibrillation"
From: Todd and Judy H.
We want to again thank you for completely eliminating my Atrial Fibrillation via your mini-maze operation. After seeing 3 heart doctors for a year and a half that seemingly resulted in zero to negative results, God answered our prayers and we found you. We went to your seminar in early March made an appointment to talk to you, had the operation on March 22, 2010 and left the hospital within 2 days completely cured with no more worries, no more medicine and no more doctors visits. You were booked for months but did 2 operations on one day so I could drive to Rice University to see my daughter graduating and bring her home. You are the most knowledgeable, understanding, trusting and caring doctor I've ever met. We see you as a conduit for God's miracles. We would also like to thank you for seeing my son on such short notice after he recently learned he had A-Fib. We contacted you on 1/7/2015 while you were working in Texas and made an appointment for my son for 1/9/2015 when you would be back in Cincinnati. You relieved us and my son of his worries knowing what his options are should his A-Fib worsen and who he can go to should he need more help. God bless you for the person you are and the work that you do. "Over four years...normal sinus rhythm"
"My Battle With and Success Over Afib"
I am a 66-year-old male, retired US Air Force Heavy Jet Tanker/Transport pilot, with a long history of afib, and currently living in Cincinnati, Ohio. My afib doesn't make me unique; there are over 2 million afib sufferers today, in the US alone. Though many don't suffer any discomforting symptoms and have a relatively low frequency of episodes, there are a substantial number of us that are "symptomatic" and very aware of our afib. This is my story. After several years of acid reflux (a possible warning sign), I had my first afib episode 14 years ago (June, 1991) under conditions of extreme psychological work stress as a mid-level executive, program manager in the aerospace industry. An Emergency Room visit was able to convert me back to sinus rhythm with intravenous (IV) drugs over a period of about 8 hours. This episode was followed a few weeks later by what appeared to be a flu-like viral infection resembling the worst case of flu one could imagine (aching joints, fever, cough, night sweats, continuous headache, back aches, etc.). This illness lasted unabated for 9 weeks. My family doctor tried numerous medications and treatments without success and ultimately diagnosed the problem as possible viral pericarditis (heart lining inflammation). I went for another year without any heart medications until I had my second isolated episode. This was triggered by an improper drug prescription (Hytrin), which was prescribed by an urologist to treat BPH (prostate enlargement), at an initial dosage level contrary to the manufacturer's warning/recommendation. The first application of this drug (designed for hypertension) caused me to pass out and I awoke in afib. Again I was converted at the ER with IV medications, this time taking over 15 hours. I remained arrhythmia free, without medication, after that for 5 years (until 1997) when the arrhythmia episodes began again in very short duration (less than an hour) and in frequencies many days apart; they converted spontaneously and were of a mostly vagal nature. Gradually the episodes got longer and the interval between them became shorter. I was aware from the www.afibbers.org website that atrial fibrillation was not a heart condition, but was a neurological problem in the electrical system that controlled the heart pulses, so I opted to make initial contact with an electrophysiologist (EP). He took my history, made no tests (except an EKG which showed a normal sinus rhythm, at that point in time), and prescribed several drugs, including antiarrhythmics, beta-blockers, and digoxin. These had no positive effect, as the episodes got progressively worse. By March of 1999, my afib had worsened to the point that it had become permanent (chronic). Meanwhile, I had changed to a different EP who merely changed the variety and dosage of medications as he unsuccessfully tried to treat the symptoms without determining any possible cause(s). Neither EP suggested or attempted to use electro-cardioversion. By this time, the ongoing afib had caused my first episode of congestive heart failure (CHF) symptoms (shortness of breath, cough, and swelling ankles), with my EP seemingly remaining uninterested and unconcerned. My family doctor diagnosed a fluid build up in my lungs with an X-ray and started me on a temporary regimen of Lasix (a diuretic) to purge the fluid build- up. After this experience, at the suggestion of my family practitioner, I changed cardiologists again, and the new doctor was quite upset that no one had attempted to electro-cardiovert my afib early on. He scheduled me for the procedure after stopping all medications in May '99. This attempt proved unsuccessful. I remained in continuous afib, and was referred to another EP, 120 miles away in Indianapolis, Indiana, who assured me that he could successfully cardiovert me. The second attempt was scheduled for July 1999. This new EP hospitalized me for 3 days while he loaded my system up on Tambocor (flecainide), digoxin and beta-blockers. The attempted electro- cardioversion was again unsuccessful and I had to remain in hospital for two additional days while they attempted to bring my heart rate and blood pressure under control. I left the hospital on medications substantially elevated from those used prior to the attempt, but still in continuous afib. Up to this point I had been prescribed virtually every one of the popular anti- arrhythmic and/or heart drugs currently in use and all without any apparent affect other than a variety of undesirable side affects. These included Quinaglute, Toprol-XL, digoxin, sotalol (BetaPace), flecainide (Tambocor), propafenone (Rythmol), Cardizem-CD, Lopressor, and Altace, all in individual and in multiple combinations and various dosage levels incurring a variety of combinations of the side-affects known for each. After being in continuous afib for over 15 months, and suffering a worsening quality of life including occasional CHF symptoms, in desperation I made contact via email and finally went to the Cleveland Clinic some 250 miles away. They recommended immediate attempt at cardioversion, again by hospitalization and loading up my system with appropriate drugs prior to the cardioversion. After three days of high-level loading again with Tambocor (to a level nearly 50% higher than the previous cardio-version attempt) and other drugs, I spontaneously converted just mere hours before the electro- shock was to take place   having been in continuous afib for exactly 17 months (since Aug. 2000). When I was discharged, I was on a very elevated Tambocor dosage along with BetaPace, digoxin and beta-blockers, but was suffering from headaches and BP in the 160/100 range. The Tambocor at the high levels (525 mg/day) completely scrambled my brain, affecting hand-eye coordination, balance and cognitive functions. After five days the afib returned, slowly at first and then once again increasing. At this point I self-discontinued the digoxin and the afib stopped within 27 hours of my last dose. When I told the Cleveland Clinic EP that I had quit the digoxin, he just agreed that, "this was probably a good idea and was an old drug and essentially not indicated for afib". (I wondered why was I paying a doctor for care and advice?). Eventually I reduced my daily level of Tambocor from 525 mg/day to 300 mg/day. This largely alleviated the severe side affects, that I had been experiencing, to a tolerable level. However, the afib once again started up on an intermittent basis. In Feb 2002, I began to suffer from angina induced by walking my dog outside in the frigid sub-zero wind chill. After 5 increasing attacks over four weeks, I went to the ER. An angiogram was performed and I was scheduled for an immediate dual bypass graft. My afib abated somewhat after the bypass surgery, but again began to increase. I remained on the Tambocor at 300 mg/day. By mid summer 2002 I was again in near-continuous afib. By Nov 2002, I was suffering from over 30 health issues that were all traceable directly to published Tambocor side affects. At this point I had been on this drug since 1999 and it was no longer controlling the afib. Upon presentation of this list to my family doctor he agreed to phase me off of the Tambocor and substitute amiodarone, a highly toxic and dangerous anti- arrhythmic drug; a "medication of last resort". I related the shortness of breath to the Tambocor toxicity and tried to offset this as a temporary initiative by taking hyperbaric treatments, making hyperbaric chamber "dives" to 2 atmospheres for an hour every other day. This helped somewhat, but had no lasting benefit. On Dec 26, 2002, I went to the ER to obtain a supplemental oxygen prescription. They diagnosed CHF and admitted me for IV treatments to purge the retained fluids and reduce heart rate and blood pressure. While still heavily under the effects of Tambocor toxicity, which I had just fully eliminated in the previous 24 hours, and while still full of fluids, the "holiday assigned" resident junior cardiologist ordered an echocardiogram. With the retained fluid, high heart rate and residual effects of the Tambocor, my ejection fraction was reported as 15% (norm is 50 to 60%) and the resident wanted me to take an immediate angiogram with a preliminary diagnosis of stenosis of my bypass graphs, or possibly the need for additional bypass grafts. I refused on the basis that according to my family doctor, if this had been my typical ejection fraction, I would have needed a pacemaker long before now. Also I had taken a cardiolite stress test (treadmill plus nuclear trace dye) a mere two months previously, which had shown normal circulation in the heart. I insisted on obtaining a second opinion before undergoing what I believed to be an unwarranted angiogram. Changing cardiologists, once more, I was again diagnosed with elevated heart rate and B/P, and he focused on bringing these numbers into the normal range by medication. Once this was achieved, a follow-up echocardiogram was taken in April 2002 which showed a "remarkable" recovery of ejection fraction to 40% (confirming my earlier suspicion that the first echo was not representative due to the circumstances). Though the rate control technique reduced my symptoms, I was still plagued with significant quality of life issues (depression, fatigue, malaise, anxiety, insomnia, lost libido, a feeling of being much older, etc.) and increasing episodes of congestive heart failure. In the meantime, the University of Cincinnati, and Dr. Randall Wolf were making breakthrough technology on a capability to perform the "maze procedure" using micro-surgery and an endo-scopic device, rather than as an open-chest procedure. Called the "mini-maze", this procedure is performed by making a 3 to 4 inch incision on the side between the ribs, high in the rib cage, with a smaller incision several ribs below for the endo-scope, which is used to observe the surgical field. Through my current cardiologist, I received a referral to see Dr. Wolf for an evaluation to see if I might be a candidate for this newly developed procedure. Initially he was reluctant to consider me as a candidate due to the prior bypass surgery (which could cause potential difficulties due to related scar tissue), and the length of history I had with afib (recognizing that this was still a new and developing technique). However, I was able to prevail on him to take on my case with some added latitude that would permit him to abort the procedure, with my advance agreement, if it proved questionable. The procedure was performed and the results were better than anticipated. During accomplishment of the mini-maze procedure, Dr. Wolf discovered that an adhesion had taken place during my Feb. 2002 dual bypass surgery, which had fused the top of my right lung to my heart. This adhesion had caused unexplained substantial muscle pain and spasms on a near 24/7 basis for nearly three years following the bypass surgery and had triggered and aggravated my arrhythmia. He was able to separate and cauterize this adhesion. He also removed the left atrium appendage (cause of 90+% of heart related blood clots that trigger strokes). He found that one of the bypass grafts had formed an adhesion to the appendage and he had to separate that adhesion very carefully before the appendage could be removed. He also conducted NPT (neurological path testing) on the nerve bundles in the heart and found several nerves that were hyperactive (a probable source of the afib extra pulses). He surgically desensitized or neutralized these. I awoke from the surgery in wonderful sinus rhythm and have remained continuously in sinus rhythm, ever since. The recuperation period lasted about ten weeks with gradual reduction of the soreness and restrictions from the surgery. Recovery to a nearly pain-free state took approximately 5 months (unique in my case due to the added scope of surgery to clear scar tissue from the prior surgery). A follow-up exam was done two weeks after the surgery, and again at six weeks. Dr. Wolf kept me on my pre-surgery medications so that any changes that occurred were attributable only to the surgery. At the six-week follow-up, Dr. Wolf terminated my amiodarone antiarrhythmic medication with no negative affects. At nine weeks after the surgery, a follow-up echocardiogram was performed to see what the impact was on my ejection fraction and mitral regurgitation. The results were very positive showing a noticeable reduction in the size of the left atrium, a substantial reduction in the mitral regurgitation to "trace" levels, and an improvement in the ejection fraction (up from the pre-surgery reading of 40% to near normal range of 46%). At twelve weeks (dictated by being off amiodarone for six weeks), I was monitored on a 24/7 basis by a portable CardioNet device for a period of two weeks to assess if there are any remaining episodes of arrhythmia. This verified a stable sinus rhythm with absolutely zero abnormal beats. At this point my Coumadin medication was next eliminated. Subsequently, my energy levels and routine have returned to normal levels. The symptoms of CHF have disappeared. And I am no longer on the Lasix medication. I must add a personal observation. At the outset of my atrial fibrillation in 1997, I was acutely aware anytime my heart went into or came out of afib. It even would wake me up from a sound sleep; it was so conspicuous. During one pre-bypass period of 17 months, I was in continuous afib. After the bypass, I was again in persistent and near-continuous afib for more than a year, but I had either become acclimatized to it, or there was less of a transition since I didn't perceive the afib initiation as much. For the past 10 to 14 months, I had once again been in continuous afib. My post mini-maze surgery with its total return to sinus rhythm gave rise to a surprising and delightful psychological effect. The long-term continuous afib had subconsciously created a sense of anxiety, depression, and malaise   things weren't right in my physical condition, and there was little motivation to pursue new long-term goals, adventures, or even any desire to travel far from home. After the surgery, I awoke in strong sinus rhythm and euphoria that "all was well with the world" and I now have motivation, energy, and a bright outlook on life (even though I just turned 66 two days before the surgery). My health continues to improve as the various bodily organs resume to full oxygen circulation that was deprived by the chronic afib. I now walk two plus miles every day when the weather is not wet, and can do so without becoming winded or strained. I have begun a course of physical exercise to limber and strengthen muscles left weak from the fatigue caused by the afib. Dr. Wolf is now traveling all over the US and a half dozen international sites (including Canada) teaching his new mini-maze procedure. In the US, Medicare and most major medical insurance policies have certified this procedure for coverage. I highly recommend this advanced surgical procedure to anyone afflicted by major, uncontrolled afib problems. Not only will it successfully improve your quality of life, it may also save you from congestive heart failure. I wanted to wish you both a very happy new year and good health. After Christmas in Texas with my family I thought about what was the best gift I had received this year. Besides spending the holiday with my family, I knew that I had just finished one year from my surgery without any incidents and my heart is going fine. Thanks to Dr. Wolf I am doing fine and I hope it stays that way. I have spoken at length with two people who had the surgery before me and have not had success and face additional ablations which I guess they are doing to repair things not done in the surgery. Thank you again for what you did for me and I hope it will continue to be successful. Doctor Wolf's Mini-Maze procedure for atrial fibrillation has been a significant advancement in the treatment of this frustrating disease. About ten years ago, I developed sporadic atrial fibrillation and went through all the anti-arrhythmics, eventually breaking through each form of drug therapy. As a practicing anesthesiologist, I was especially frustrated by episodes of atrial fibrillation while performing long on-call hours. A cardiovascular surgeon at Lutheran Hospital referred me to Dr. Wolf. On October 15, 2007, I underwent the Mini-Maze procedure, performed by Dr. Wolf. I was discharged two days later. Since that time, I have been free of atrial fibrillation. I have also stopped taking coumadin and amiodarone. Dr. Wolf has made a tremendous change in my quality of life. You have performed two surgeries on me...a single by-pass in February 1997 and the Wolf Minimaze procedure March 18, 2005 to stop Atrial Fibrillation. Both these surgeries were apparently completely successful...and from my perspective, both were painless. I felt then, and do now, that the single bypass could have been done as an outpatient. With the Minimaze procedure, I remember the nurse coming into my room a day after the surgery and asking, “On a scale of 10 to 10 being the highest, where would you rate your pain?” I responded, “I would put it at “0” because there is no pain...and there never was. I have told many people about the procedures and will continue to do so. I have not been on Coumadin since before the Mini-Maze. I had a bleeding problem about a year before the surgery. Because of my age and lack of other risk factors I felt and my Dr. agreed that it would be best if I came off the Coumadin. That was also one of my deciding factors in choosing your procedure and you to perform it. You didn't require the Coumadin. My feeling was that if I was prone to bleeding in my leg I could be just as prone to bleeding in my brain so that was a big factor for me. I have not been on any meds since discontinuing the amio. I'm not sure what you mean by follow-up monitoring. I have not worn a halter monitor or any thing like that. I had a stress test test about a year ago with good results. In the past it would have triggered an episode but not any more. I have the occasional skipped beat but even vigorous exercise does not cause a problem any more. I can't tell the difference between a-fib and a-flutter but I can certainly tell when I'm not in sinus rhythm so I feel very confident that I am truly cured. Hardly a day goes by that I don't take the time to feel my heart beating regularly and thank God for you and your procedure. I'm sitting here eating my breakfast, relaxed, in an excellent state of mind WITH A NORMAL HEART BEAT! You and your staff have given me back a normal life. From Aug. 6, 2006 (date of mini maze) my heart beat has been on target. I am truly grateful. I'm recommending Mr. Wolf and staff to anyone with a speedy heart beat. I am A fib and A flutter free and have been since October 2003 when I had a cardio version at OSU. I certainly am a proponent of the minimize procedure. It returned me to a quality of life I had before I was diagnosed with A fib. Various medications did not do the trick but the minimaze obviously did. I wish Dr. Wolf success in his new venture with Dataquest. I only hope he continues to practice surgery for the benefit of others. I think about you more often than you know. I wonder how your son is doing. But mostly I am forever indebted to you and Dr. Wolf for the care you provided me during my surgery last May. I have been in the hospital several times for athletic injuries but I have never had the type of care I received during my stay in the cardiac unit at the University Hospital. It was well worth the trip from Los Angeles. Three weeks to the day of my surgery I converted after over a year in constant Afib. My heart continues to beat completely normal, in fact my cardiologist Dr. Bhandari at Good Samaritan Hospital of Los Angeles just gave me a 24 hour halter monitor and when he read the results his nurse said he had only one word to describe them, “Remarkable”. He said he hadn’t seen anyone with Afib as serious as mine return to such a normal heart beat. Two months after my surgery I resumed a full exercise regimen, 3 days a week of weight lifting, cycling over 10 miles a day and running 2-3 miles. It has been 6 months since surgery and I ran 5 miles today at 8 minutes a mile. Prior to my Afib I could run 7 to 8 miles at 7 minutes per mile. I am not back to that pace yet but I am thrilled to say I am well on my way and my training continues to increase weekly. I am blessed and excited to resume snowboarding in the next couple of months as well as regularly playing basketball once again. Thank you Nessie for all you did to arrange our time in Cincinnati you were a great blessing to both me and my family. Have a great Thanksgiving. P.S. This weekend I will preach a Thanksgiving message to several thousand people that will include how grateful I am to be well, THANK YOU and DR. WOLF!